When a group of four people have to land on an unknown planet to regroup and repair their ship, they decide to split into two groups – a man and woman who do not want to risk the flight back remain on “Eden” alone, and the two others set back off for Earth with promises to send a rescue ship as soon as possible. Generations later, the people of Eden are still waiting. Still hanging out in exactly the same crash-landing spot. Still following the matriarchal rules structured by the mother of all. But their small area is becoming too crowded. They have to forage farther and farther for food. John Redlantern is frustrated with “Family.” With their stubbornness at remaining in one spot when they could clearly spread out over the vast planet and have enough food for all. He’s tired of the extreme ritualistic nature of “Family.” The artifacts from planet Earth are passed around to be “ooohed” and “ahhhed” at, but they are meaningless to a people who have never experienced technology. John is tempted to disrupt the circle of the past, and create a new path for the “Family.” In doing so, he breaks down everything “Family” represents. Let me start with an important point: although John Redlantern and his friends are teenagers, this is not a teen book. It’s “literary science fiction.” The beginning of the book, which builds the world, the people, and the tension, is really long and slow. It was a bit of a slog to get to the turning point. Once that happens they story finally begins to move a little faster – but even the post-turning-point action is slow. The reason the narrative is so slow is because this is a story about Meaning with a capital M, and not about plot or action. Don’t get me wrong. There’s a plot. A plot with Meaning. There were several allegories to the story. The obvious one is the Biblical creation story. It’s all about how innocence is lost when people begin to get bored. But boredom is in our nature. Without boredom, we never learn new things. And new experiences don’t just change you, they change the world. 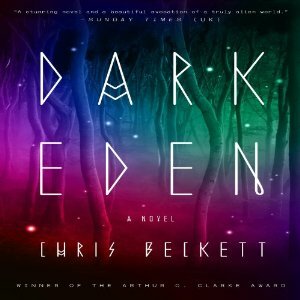 Dark Eden demonstrates the irony that change is needed to survive, but change is destructive to survival. It’s not just a book about changing the world. It’s also about how the world changes the individual. The main characters in the book, especially John Redlantern and his lover Tina Spiketree, develop into strikingly different people as they adapt to the changing world. Innocence is replaced with deviousness. Ivory towers collapse, covering all bystanders with dust and grime. This is a story of identity. In other ways, Dark Eden is a book about faith. How faith can lift you up and keep you strong during difficult times. But how it can be manipulated against you, as well. And how, as you realize everything you had faith in is mistaken, you are first paralyzed with numbness, but then are able to move on as a new person. I want to give a good review for this book with so much Meaning. I mean, it should have been good. It had Meaning. But a great book has both Meaning and an ability to fascinate even if you don’t see the Meaning. Dark Eden did not. In Dark Eden, the story was lost in the darkness because you were blinded by the bright, shiny Meaning. It was too slow, the hero wasn’t even likable if you considered him an anti-hero, and it was thoroughly uncaptivating. I totally understand why it won the Arthur C Clark award and why it comes so highly recommended. Beckett’s world was unique – colorful and dark at the same time. The setting was unsettling and realistic within the boundaries of science fiction. The lingual drift was a nice, realistic touch. But most of all, the book was slow and Meaningful. I really loved Station Eleven and this sounds similar, but it doesn't seem like you really loved it and I think the gender divide thing would drive me crazy, so I'll probably pass on this one. The cover always intrigues me though! I love thoughtful and “meaningful” science fiction. The themes and ideas here are also ideas that are of interest to me. It is really too bad that this book sounds like it falls al little short. Interesting to hear your thoughts on this one – I think all other reviews I've read of it have been extremely positive. Well, I've heard of a lot of people who loved this book, so don't go only by my review. It certainly had merit. This was, on the other hand, indicative of what all three of my RL book club felt about this book. And we decided not to read Station Eleven for that very reason. Well, like I said, this book won the Arthur C Clark award. There were an awful lot of people who liked it. I just found it a bit slow, myself. The Meaning was very interesting. This sounds interesting, and while it may be more “literary” than the sci fi I prefer, I am intrigued by it. Nice reviews! Thanks Greg! It certainly is an interesting concept.